Do you have days where you wear something without pockets, but still need your phone? Does your exercise attire not have pockets for your iPod? This holder will solve both of those problems so you have access to your phone and music, no matter what you wear. Row 3 – 39: 1 sc in each st across; ch 1; turn. When you finish the last sc, ch 150; sl st into top on opposite side. This becomes your handle; this one was made long enough to go over your shoulder so your phone rests on the opposite hip. Keep in mind the handle will stretch a bit one your device is inside. Work one sc down the other side, remembering to only go through one loop on each side. Fasten off. Working through one loop will give the pouch a bit of room to stretch to accommodate your device. Note: The number of chains may be adjusted to whatever length you wish your handle to be. This project is very quick to make; for the experienced crochet artist it may be completed in less than an hour. For those who have several outfits without pockets, why not make a pouch to match each outfit? 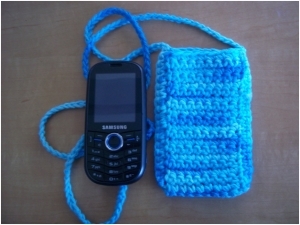 It is very possible to make two pouches from one ball of yarn.